Please take note our studio will be closed on 01 Feb 19 to 08 Feb 2019 for Holidays break! All orders will be processed on Sat, 08 Feb 2019, onward. Please write us your concern about your order and we will make the further action as soon. Sorry for any inconvenience caused. Wish you all have a wonderful day! Welcome to Neue Graphic Etsy Shop! We create Typography Wall Art, Motivational Posters, Inspirational Quotes Print for modern living space. We believe that great design and Inspiring words can make people feel good. Please feel free to ask any questions, I will get back to you as quickly as I can. It's a bit expensive. Looks lovely. We love everything that looks vintage and mid century modern design. Neue Graphic started as a design journal on sharing of wonderful illustration artworks, design and interesting designer craft created by the great artist. Also, we used to showcase typography posters that we created to decorate our home and studio, mostly as motivation piece to us. We love typography, Illustrative design, and words that Inspired people. 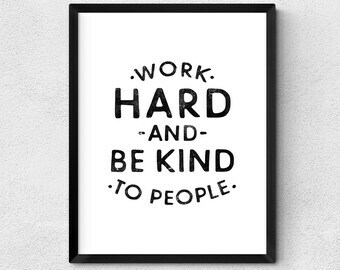 That’s what Inspired us to focus on creating art print that inspired by words, and most based on great quotes to bring meaning and inspiration to your studios, offices, and homes. 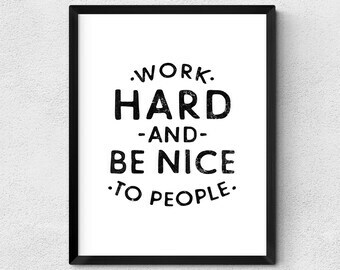 At NeueGraphic, we believe that great design and Inspiring words can make people feel good. We believe words are powerful, whether for a child or an adult, every print should come with a motivation purpose, to keep us moving. Our next step on this journey is to continue on series of prints collection and launching of goods including cards, apparel, and home decor that surround with our belief, to motivating people through design. Graphic artist and designer behind Neue Graphic. Our offices are located in Latvia, California, and North Carolina, our team members hail from Latvia, Canada, and the United States, and we print and ship to customers around the world. We take about 2-7 business days to create apparel products (t-shirts etc.) and 2-5 business days for non-apparel (posters etc.) products. Then you should add shipping times on top of that. We have both fulfillment center in Los Angeles and Malaysia to print and mail our original poster (In specific of poster size from 16x20 Inch and above) throughout Europe. This will shorten delivery times for United States buyers! We will decide the best way where your order shipped from. If you have a question about your order, please contact us for clarified. What if the product is damaged or lost in the mail? We'll ask for a photo of the damaged goods, and we'll then gladly send a replacement. All package shipped with tracking number. You may track your order status with the tracking number provided. If your package happens to lost in the mail, we will go through the verified process with postal service and send you a replacement after that when needed. • If you have ordered the wrong size, please inform us as soon as possible. If the item still not yet in production, we can change the size for you. We are unable to offer exchanges of size after the order has been fulfilled and shipped. • Orders that are returned to us due to an incomplete or incorrect address provided will not be returned to the customer and will only be resent at the customer's expense. • Orders that are abandoned by the customer for any reason will not be returned to the customer and will only be resent at the customer's expense. • We can't guarantee on shipping condition as some of our package get held in customs / post office and buyers are responsible for claiming your goods from customs / post office. Who Pays for Customs Duties Fees? Buyers are responsible to pay the additional costs such as duties, taxes, and customs clearance fees. Neue Graphic does not have any responsibility on these additional charges that may apply.